Just this past week I had a conversation with one of my hitters about the timing and sequencing of his movements and the importance of things happening sequentially. 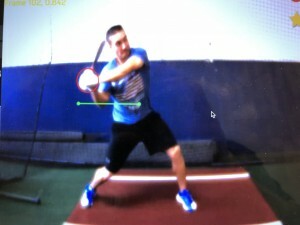 This particular hitter had the problem of his back elbow and top hand moving together during his downswing. This move was causing him to cut through the zone and miss-hit a lot of very hittable balls that he should have been crushing. This also led to him pushing his hands through the zone which isn’t great for repeatability and maximizing his power. The main root of this problem seemed to stem form his elbow and hands moving at the same time instead of his elbow moving down, stopping, then his hands moving down, stopping, then finally delivering the bat head through the zone. After seeing this reoccurring problem, I explained that human movements that are efficient in nature all have a very specific order of events that need to happen one right after the other. I used an example of a whip, I explained that when cracking a whip in order to move the end of the whip you must accelerate the handle, then through an order of events energy is transferred from the handle throughout the body of the whip then ultimately the end of the whip moves. 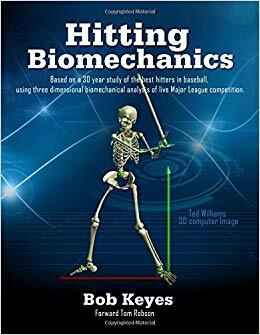 In hitting the body works a lot of the same, summed up, the back-foot turns, the back knee turns, the femur turns, the pelvis turns, the thoracic spine turns, the back elbow drops into slot, the front arm pulls, the hands fire, then the end of the bat gets delivered to the ball. After going through the explanation of the movements this gave the hitter a framework in which to move and a reference to compare himself against. Breaking down video I used a circle around the hands to help illustrate how the body unwinds THEN as a result of the body turning the hands are pulled by the body instead of being pushed through the zone. The circle around the hands really seemed to help him view unloading the body in a different way than he had seen before. Here is an illustration to help you see it in a real swing. In the first image, you can clearly see that he is in a “position” to do nothing other than push his hands through the zone. 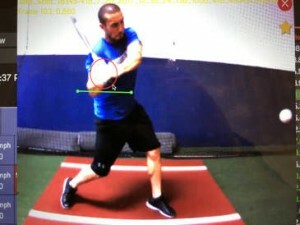 You can see the hands in front of the elbow creating a pushing pattern. In the second and third clips, you can see the elbows slightly in front of the hands which allows for a great deal of space to operate from. ​In the pushing example, you can see he is cutting through the back of the zone. From here the only option is to hit everything extremely far out in front of the plate. 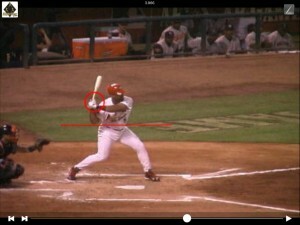 This is necessary in order to give his bat a chance to accelerate. If he hits the ball deep into the zone he will experience a lot of off center hits that create a lot of spin and not a whole lot of velocity and distance. Start with the foundation in mind. Happy New Year!